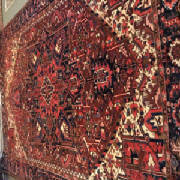 Persian Heriz Vintage Rug 9'" x 12"
Rich, dark palettte of red and blues, pinks and cream. Open fields of geometric and multiple pretty borders. 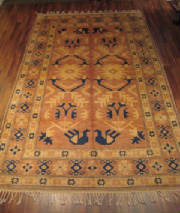 Turkish Oushak Rug 6'3" x 8'2"
Ancient, traditional Oushak designs. 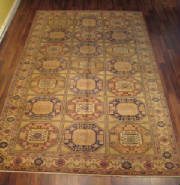 Tan, brick red, brown and gold. 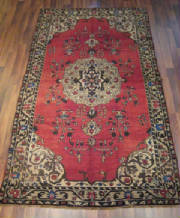 Turkish Anatolian Rug 4'11" x 8'4"
Rounded central medallion with cream background surrounded by rich red. Blue, purple, brown. 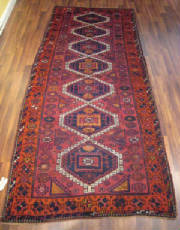 Turkish Anatolian Rug 4'7" x 10'2"
Repeating geometric medallions. 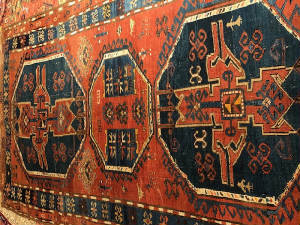 Darker palette of reds, blue, orange, gold. A little crooked with pretty braided edge. 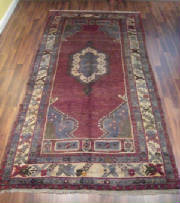 Turkish Anatolian Rug 5'4" x 10'6"
Burgundy field surrounds central medallion. Silver gray blue green. 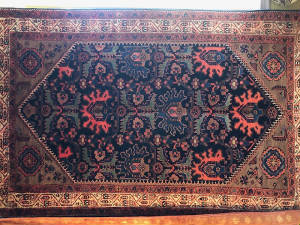 Lovely abrash color variations. Repeating round octagon pattern is fun. Blue, gold and green on tan. 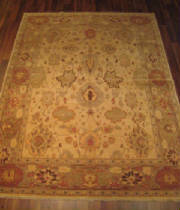 Turkish kazak Rug "5 x 7"
Turkish Konya Rug 4'10" x 8'9"
Natural undyed wool background. Uniquely imperfect medallions. Salmon and green. 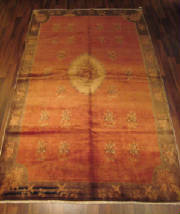 Turkish Oushak Rug 5'8" x 9'2"
Golden hues with variation in nap. Salmon, blue, green. Small medallion on large open field. 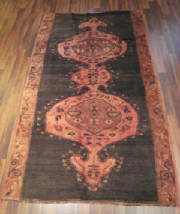 Turkish Oushak Rug 6'6" x 10'2"